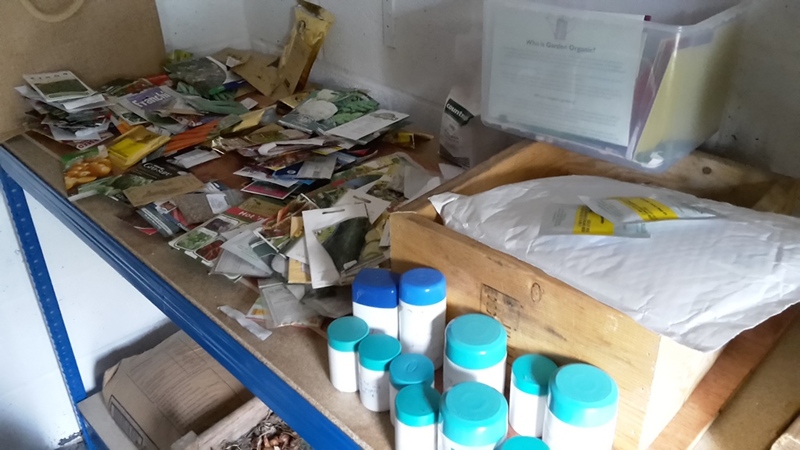 The other night I decided to organise my seeds a little better and get rid of some old ones. I started sorting them into piles of different groups and families. When I stepped back to look it turns out I've got quite a few! I'm going to make something to keep them organised so I know where everything is. Any one have any links to a good seed organiser or any good ideas? Preferably one I could make to sell! I've shown pictures of the apple store I built for my mother before but I thought I'd show you all a picture for what some of the apples look like in it now. Scotch Bridgett - one of our favourite keepers. Although they're not going to win the village show it does prove that we can keep apples with no pumped in gases or artificial cooling well into April and May. Careful picking, storage and selection of variety is all that is needed. You need to be vigilant with checking them and remove any that go bad. Sadly keeping food in this way is a skill we're slowly loosing and one day we might all need it again. Best to practice with food storage now I think, when the results aren't quite so important! Back at Christmas mum gave me a voucher for a days gardening tuition at walled garden over by Bridgnorth in Apley, She was also coming with me, so it was a great way to spend time together (and she loves anything to do with gardening) and hopefully I'd learn lots. I thought this was a great present but it turned out to be so much better than I thought. Apparently she'd booked the course just before they cancelled running it, but they decide to honour our places. This meant that we got a private course for just the two of us for the whole day! We met the head gardener, Phil Allen, at Apley farm shop, had a drink, discussed what we wanted to learn and talk about during the day and then headed down to the walled garden. As soon as I met him I knew it was going to be a good day, he's completely passionate about what he does and it was obvious from the start that he had a wealth of knowledge and a willingness to share it. The garden is amazing, four years ago it had been completely over grown, untouched for forty years. Now the whole four acres were under cultivation and looked after by Phil pretty much on his own. Add to that the fact that the garden is starting to make a profit and supply the farm shop and local restaurants and it gets really interesting. I think the thing I like most was that this was a proper working model of how large scale gardening/small scale agriculture can work in the UK. Every plant or area had a purpose, a simple example was in the one poly tunnel where there was a load of Pak choi that had bolted, but this had been deliberate so a local Thai restaurant could buy it as they like to use the flowers on their dishes. The garden wasn't weed free either, and he made no excuses about this, the time isn't there for it to be like a show garden, that's not it's purpose. Fruit cage area - this picture showing peas growing under the cage. The garden was split into different areas, with roughly a quarter split off for fruit production where he single handedly picks over a hundred punnets of raspberries a week in high summer! There was also a large area where he was experimenting with a no dig method of gardening and other areas where he was trying a biodynamic approach to gardening. In it's day there was many (and I mean many) glass houses, all with different purposes, from melon houses to ones for house plants and over 33 staff to run them and the gardens. There isn't any glass left in any of them and they're all in various stages of disrepair. 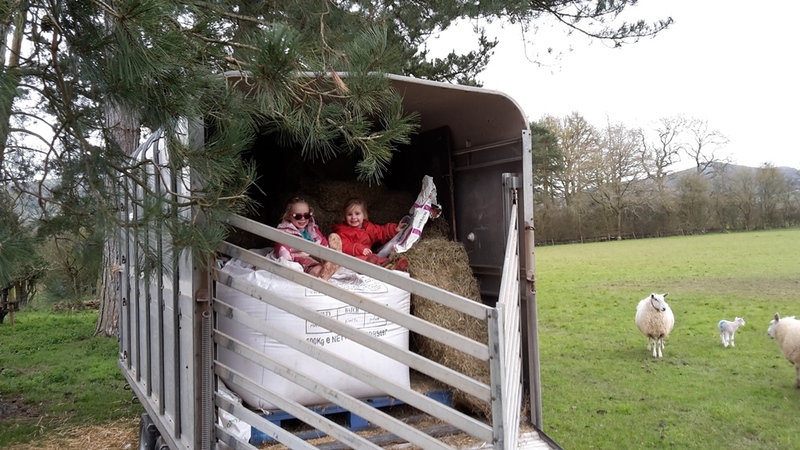 Instead of letting them sit empty though, Phill has covered some of them in plastic and is using the space inside to grow many crops that either need the warmth to grow or to grow crops early to catch the best marketability for a certain crop. Seedlings ready for potting on - well over twenty varieties of tomatoes being grown here. I think what I liked best about the whole garden is it's willingness to try to find a market for something different. As Phil said to me at one point in the day "We live in an area of farmers, so why is a restaurant going to buy carrots off me when he can buy them cheaper off a farmer whose growing a field of them, I have to offer something different. Baby carrots, different colours, ones grown for taste and not transport." He was offering so many different and unusual plants to restaurants, ones they couldn't get from wholesalers, so they were using him to set themselves apart as well. The one Thai restaurant had been winning awards with their food and they attribute good local produce to helping them win. I learnt so much from the whole day that I'm still trying to digest the information that I was given, but the main feeling I've been left with is that of inspiration. I feel inspired that I could make my patch of land here make some money so I can reduce the amount of time I have to spend away from here. I've been given ideas about market areas and revenue streams that I never even considered and I think I have the energy, drive and enthusiasm to make it work. He really embodied a "Farm better not bigger" attitude and it's one I'd love to emulate when I take back over with childcare from September, getting things in place to slowly change how I provide my income, even if it's just a tiny percentage of it to start with, and produce food for more people than just my family. I'll do some more posts on some of the tips I learnt at a later date - the one is amazing and I can't wait to share it with you all! 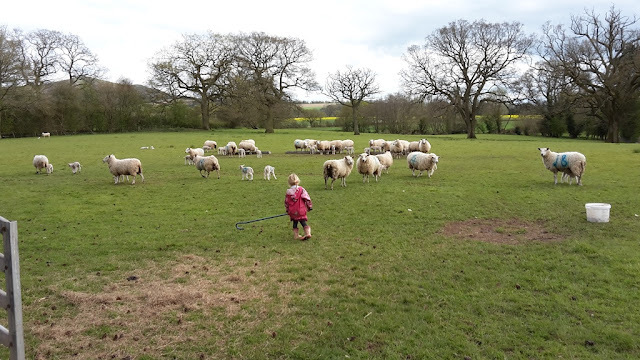 My wife posted this picture on Facebook yesterday with a caption about being left to deal with the sheep whilst I was off on a jolly (more on that tomorrow but I had an amazing day learning about market gardening)! The ewe in the picture had had two lambs (luckily no assistance needed) and my wife dealt with them and checked the sheep for me throughout the day, as well as feeding them in the afternoon. All with three children in tow! 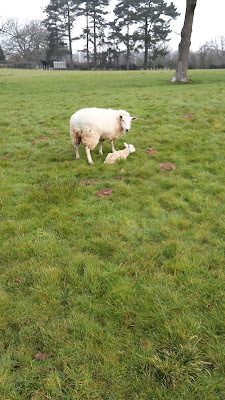 She even sprayed the lambs bellies whilst carrying Alistair! 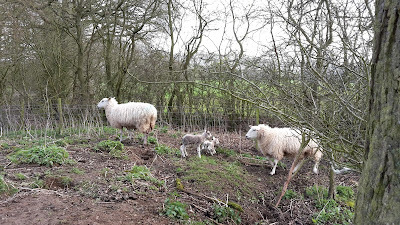 She even goes on to beat that today when doing her checks (I'm still having to go to work at this time so she's doing a few checks in the day for me whilst we wait for the last ones to lamb) she notices that the new mother had only one lamb with her, she found the other by the brook, cold and shivering. 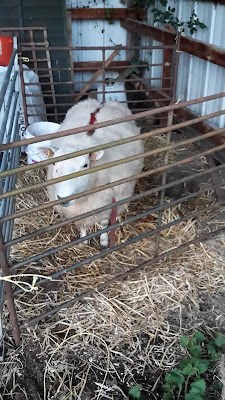 So I came home (luckily I was only working in the next village) and got her into a bonding pen with both lambs (the ewe not my wife), this was after about half an hour running round a field swearing and wanting to throw my crook at it. She was not keen on her second lamb and promptly set to try and kill it, the lamb was in desperate need of a drink so rather than mess around I rolled the ewe over and let him have his fill before putting her in an adopter pen, where hopefully he'll pick up her sent and she'll accept him over time. 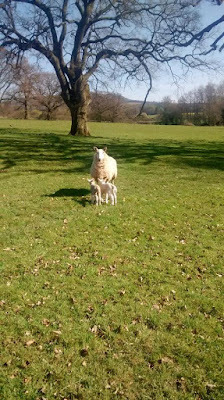 I'm sure that if my wife hadn't been really observant and spotted it when she did then the lamb would have passed the point of no return shortly afterwards. It's amazing how much she's learning about sheep and the things that she tells me she's seen on her checks. I'm always very aware that I've pushed my wife into this lifestyle, but it makes me very happy to see how well she adapts to it (whether she wants to or not!). I'm a very lucky man! 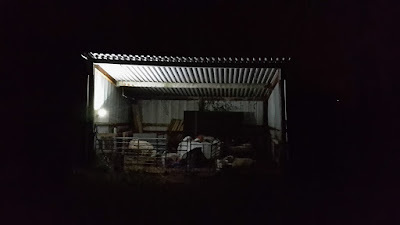 I few months ago I had a message through my Facebook account asking if I'd be interested in giving a talk on my smallholding and lifestyle at a local garden festival. I met with two of the organisers shortly afterwards and once I'd given them a guide tour (with me saying "excuse the mess" about a thousand times) they decided that I'd be right to be a speaker at the festival. Nervously I've agreed. I haven't done any proper public speaking since I left school, so it's all going to be a bit new to me but hopefully I'll think of enough things to say. Anyone have any tips and ideas on what I should talk about? What have been your favourite posts of mine from the last 12 months (if any!)? This is a post I should have written a few weeks ago, but I didn't get round to it. I recently came into some very cheap beef (but still from a trustworthy source). I had to process it fairly quick though as I had a fair amount to get through. I decide to eat some, freeze most of it and can some. I called Kirsty and she came round to help with the canning (and took some for some eating as well!). We tackled it in the usual way, although this time we were doing it at my house and it must be said that my kitchen is nowhere near as good as Kirstys for this type of thing. In fact I learnt a very important canning lesson on that Monday night - don't start too late. 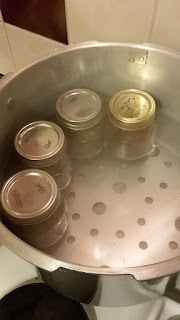 The meat took a while to prepare, then it took ages for my hob to get the canner boiling to sterilise the jars, then at about 10.30 at night I said to Kirsty to go home as everything was taking so long. The pressure canner took ages to vent the steam, then ages to get up to pressure. 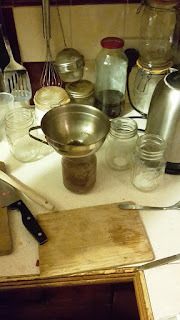 I then had to wait the hour and twenty minutes it said in the canning book for it to process and then another half hour for the pressure to reduce enough for me to remove the cans out of the canner. I managed to get to bed just after two! Some jars of dog food by the look of it! I have to admit the meat looks less than appetising sat on the shelf but I'm sure it will taste fine when added to a stew or something. Still interesting to can more meat, I wonder how much we would all have to do if we didn't have freezers as our main way of long term meat storage. 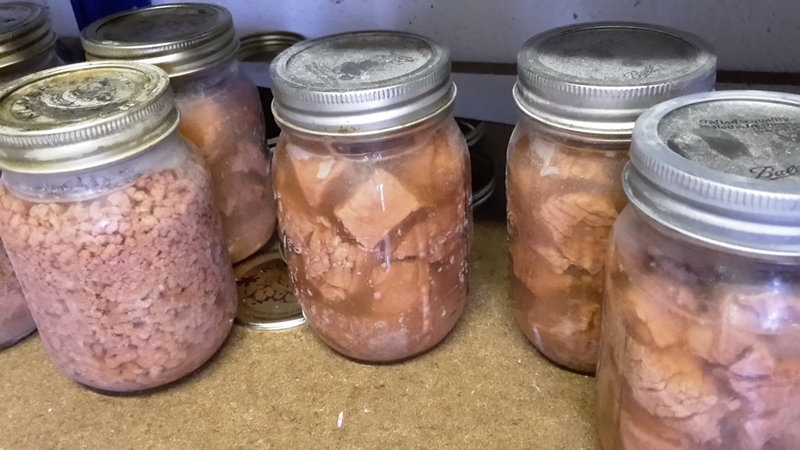 Anyone else done raw pack meat canning? What does it taste like or shall that be another surprise I've got in store!? 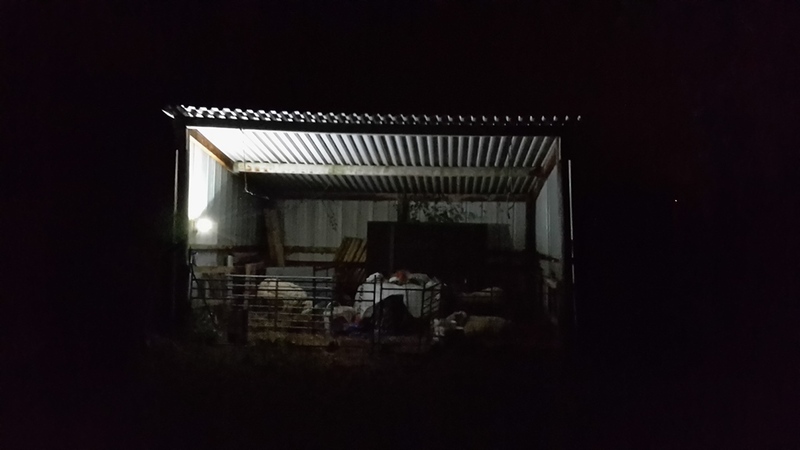 I remember the lambing shed that we used to have on the farm. Poorly lit, it used to be a nightmare to do the checks at night, dad had a big blue torch that we used to use and a few bulbs dotted here and there. Things have moved on a lot in resent years. These LED rechargeable floodlights are a real game changer for somewhere without power. A couple of these would light up any shed and they seem to last for ages. The only disadvantage is that when they run low on charge they suddenly turn themselves off that can come as a big of a shock when you're not expecting it. The magnetic base on them works amazingly as well, the picture above shows one light pointing upwards, plenty for me to work by. 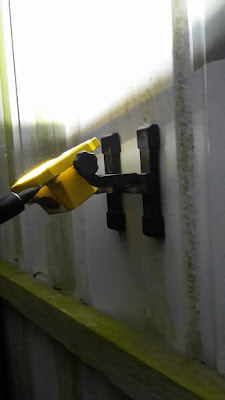 Anyone else use a rechargeable flood light? Look a non sheep post! I'm fairly sure I'm going to be pretty late to the party with this one but I picked up Betty Macdonald's book "The Egg And I" from the library the other day and I thought it was brilliant. It always amazes me that I can read a book written in the forties and it not feel dated. This book made me properly laugh out loud with all her tales of life in rural North West America, living without power or running water. The antidotes about the Kettles and their other neighbours are brilliant and she writes in a way that makes you hear their voices and I should imagine the beginning of the stereotypical "redneck". I just can't believe I'd never heard about her before. Apparently they've made films about it and there's even fan websites on-line. 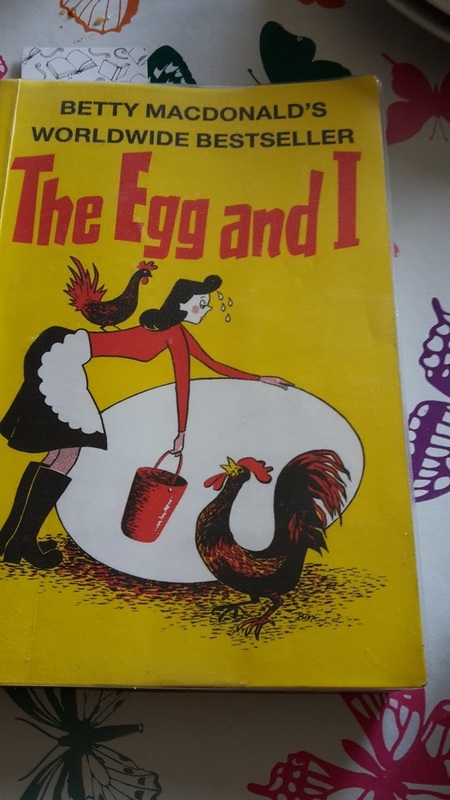 "The rooster ... doesn't give a damn if you take every egg in the place and play handball. He doesn't care if the chicken house is knee-deep in weasels and blood. He just flicks a speck from his lapel and continues to stroll around, stepping daintily over the lifeless but still warm body of a former mistress, his lustful eye appraising the leg and breast of another conquest"
Who else has read her books and why have I only just found out about them!?! I'm always keen for recommendations for books if anyone has any, just leave me a comment (I'm a bit of a book worm when I get the chance). Well the first sheep has had a lamb. Just a single but a good size and I didn't have to help. It's got a full belly and an attentive mother so I'm pleased. So are my girls to finally have skme lambs.